The Wheelie Fantastic crew ready to set off from Mapua for a day of road biking. High quality carbon bilkes available. Kilometres of road biking await you in the region - choose your route depending on your fitness level and what you would like to achieve. Spectacular scenery is part of the experience too. Road biking is a wodnerful experience on some of our back country roads. Get out into the back country with the Kahurangi range in the distance. Starting at Mapua, there are lots of options for the road cyclist. There are quiet country roads, with rolling hills or more challenging climbs. 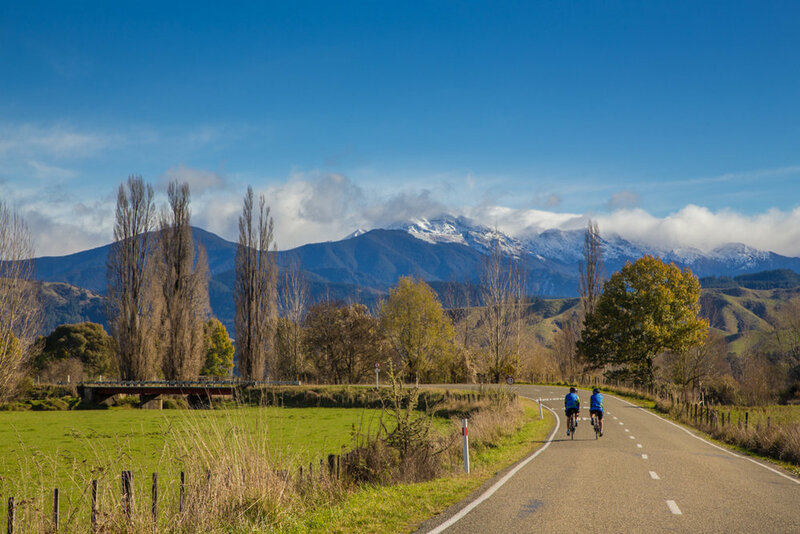 Within a few kilometres you could follow the majestic Motueka river, with Kahurangi National Park as a backdrop. The Wheelie team are knowledgeable road cyclists who will put together a route to suit you. What’s included: Bike hire, helmet, planned route with map and/or E-map provided, Look Delta, Look Keo, Shimano spd or flatbed with toe strap pedals (or the rider’s own pedals can be fitted), souvenir water bottle. Options: Guided or self-guided. Transfer to a route start point other than Mapua. We have top quality carbon road bikes for you to hire to help explore the top quality road routes this region has to offer. Whether you want to do an 80km + challenging ride or a more relaxed 30km to 50km ride we have just the rides for you. We will tailor make your tour. So whether you want a one day challenge or several days of quality rides taking in a category one climb, give us a call. The tours can be fully guided, supported or you might want to be self-guided. Build your own trip. Tells us how far you would like to go. How many days. Stay in one place or move on. Leave the rest to us. Our specialty is creating your perfect tour.